Kitchen here we come! We have raised £85,429.63 so far but I am unsure if I should add the Gift Aid at the bottom of the JustGiving page. That means a whole kitchen in Lirangwe Primary School in Blantyre, Malawi (8 seconds I'm getting good at Malawi!) and enough left over to feed another 5800 dinners to other children! Mary's Meals asked me what I would like to call the kitchen and I said 'Friends of NeverSeconds' because if it was just me I would never have managed to raise enough but now we have! I always choose the lamb meatballs when they are on the menu. Everyone gets the same number of balls because it's fair. Today we had 5. The gravy is hard to eat with a knife and fork but it is nice with the meatballs and the mash potato. There is one piece of cucumber missing because I ate it before the photograph! The dessert is called Golden Crunchie and I think it has syrup and cornflakes in it. It's one of the sticky puddings so I use a spoon so I don't have to waste any lunch break washing my hands. I think a patty is a burger, the tube by the banana is a yoghurt and I do not know what is in the Ranch packet! Now the best part and this thank you is even bigger than mine! I hope that the money you have raised goes to help a lot of people. Feel proud. Well done for your efforts. Life is good! Martha is back!!!! Wow! Together we DO make a difference, good job for starting us off! I guess the ranch packet will have Ranch dressing in it. So gald to see your hard work paying off. A big "Howdy" from Houston Texas. We're all proud to have been watching your blog and helping a little bit in your sucessful fundraising. Bar B Que Brisket Sandwich and Baked beans with some Fresh Salad and a avocado vinaigrette dressing. Great post Martha. Super to have you back ! Love the little vid, so many happy faces ! You are a phenomenal human being. Don't ever doubt it. Welcome back Martha! So happy to hear from you and so very well done! Lovely to see your blog underway again and interesting as usual! The video is good too - I wonder what exactly goes into the meal they will have in Milawi? Ranch is a type of creamy salad dressing! Congrats on being able to help so many others - that's really great! Congratulations on an amazing total. I'm pretty sure it's going to keep rising for a while. Well done to you, Veg, and everyone who has contributed. We have all achieved a victory here, not just for lifting the ban but for being able to get the kitchen and feed all those in need. Now, if we can get the rest of the world to think along these lines, we might be onto a winner. well done!! Amazing Martha. What a great video of the children in Malawi. And what a victory that you can take pictures again. Your meatballs look quite tasty. It's a shame there isn't another slot to put the cucumber in. If they're going to use the trays with slots, more spaces would be useful I think. 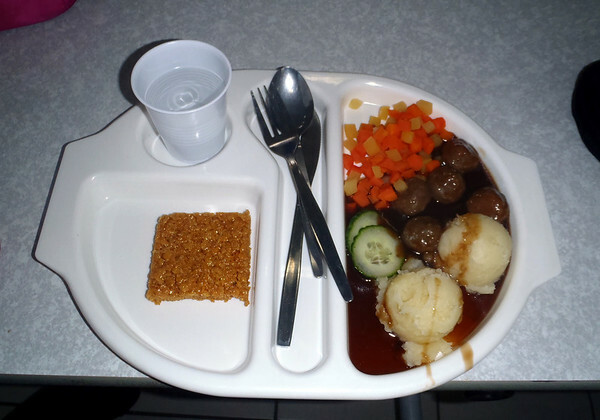 Why are school dinners the only place in the world that mash is served in ice-cream scoop balls I wonder? I remember when I was little, they were always full of lumps. It put me off mash for life. I didn't discover that mash could be delicious until I was about 35. I wonder what your mash is like. Also, Scottish meals always seem to have a sticky cake (though I know that my own kids sometimes have yoghurt). They should put fruit salad or some healthier puds on sometimes. 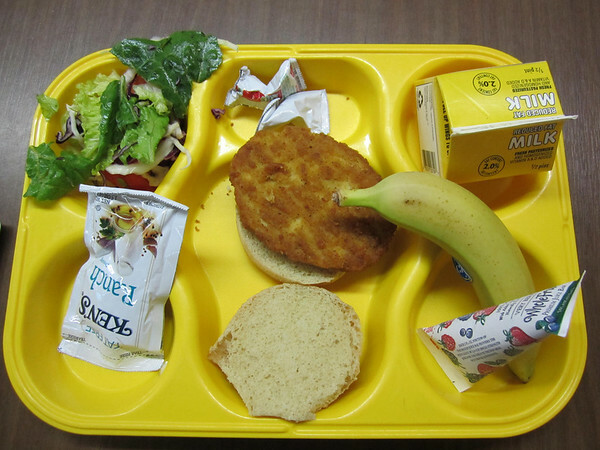 Given the fact that money for school lunches is always limited, I’m not sure that suggesting Veg’s school should buy new trays is the best way to spend that limited money. The cucumber slices could have been placed next to the dessert if getting gravy on them was a concern. For myself, I’m just thrilled that Veg’s school uses reusable trays, rather than the disposable stuff that just gets binned every day. Schools are not the only place that uses ice-cream scoops to portion out foods. Many restaurants (even high-end restaurants) do the same. Portion control (making sure each person gets the same amount and you don’t run out before everyone has been served) is much easier that way. Besides, it looks a lot nicer than just a spoonful of mash glopped on a tray. Some blind (and/or partially sighted) use this method as it's an easy way to ensure the mash ends up where it is supposed to go. Guess in a busy environment it also works well for those without sight issues. I've been looking forward to your post all day. Yes that is a little sad, but I don't care. Your meat balls look really good. I wish I had meatball while I was out now. I hope the huge amount you have raised made the trouble worth while. 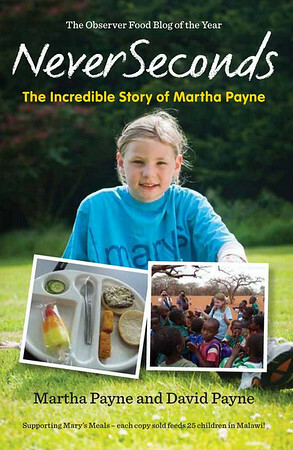 "The kitchen of Malawi bear the name of the girl Martha Payne"
Well done Martha! you gave over £85.000 for the kids of Malawi. Have you ever had pieces of hair in your food? Wow! That total for the kitchens is AMAZING!! I have waited this blog post secretly the whole day. It was really amazing to follow what happened in last three days. Must have been ground breaking experience for you! Hello fron Spain. All the newspapers writes about you and your blog. The kitchen fron Malawi will have your name. Veg should stand for "Very Enterprising Girl". Congrates on reaching £85,000+, lets hope you get a few more 1000s. Thank you for sharing that video of the kids. That was great. I am glad you are back up and running. I personally do not like ranch dressing. Especially, the kind in a tube or bottle. Basically, it is mayonnaise, sour cream, dried chives, dried parsley, dried dill weed, garlic powder,onion powder,salt, ground black pepper. How Great is THAT?! Well done Martha! Thank you! Congratulations and THANK YOU to you, Veg! I love reading your blog while having my lunch at work in Oakland, California (How many seconds does that take you?!) Today I am having kimchi fried rice which is basically left over barbeque meat with a korean spicy pickled cabbage. You should add the Gift Aid which brings the total to over £100,855,51 at the moment. Justgiving take their percentage out of the Gift Aid so I presume the figure allows for that. Congratulations to you and all your supporters. Thanks, I wondered if the total included Gift Aid, that is such a wonderful achievement. Scroll down to the bottom of the justgiving.com page and it shows the total raised and the Gift Aid amount. You just add the two together - again presuming that justgiving.com have taken their fee from the Gift Aid amount. Hello from New Zealand. We are Room 8 and we have been reading your blog. Some of the children in our class are going to be writing their own blogs soon! Well Martha, You have taught the world in a very significant way that never seconds is much better than never firsts. Your wonderful and heartwarming blog will help make sure that a lot of hungry children will get firsts for a long time. It's fantastic that what started out as a bit of a lark has turned out the way it has. Just saw a pic of you with your stookie and you look C-U-T-E. I like Ranch a lot, but usually have a vinaigrette as it's healthier and just as tasty. It's good to see you back - I enjoy reading your blog. Congrats Veg on both the kitchen and on getting back to blogging! I've checked back 3 times today in anticipation of your post. I'm so inspired by you, keep up the great work! As an American (Washington, DC) we see a lot of ranch salad dressing, its the most common dressing here and my least favorite. Its not very healthy either. Good job VEG!! Thanks for sharing the awesome video from the kids in Malawi with us! And a big congratulations on exceeding your fundrasing target (by a lot)!! Glad you are back ! VEG! Welcome back! Remember that we support you always. Looks like a great lunch. Oh my gosh!! Look!!! Actual vegetables! And a full tray!! Veg, it’s so good to see you back. And that video of the kids in Malawi? Well, I think I need a tissue. Your blog is so interesting. I wish I had had school dinners like yours. Believe me, in my day they were much much worse. You are one in a million, an inspiration to us all. Martha, you make my heart sing. What a wonderful thing you are doing and have done. I haven't seen any Canadian School Children post their lunches... hopefully soon as I am writing from Sudbury Ontario Canada and I would love to see what our children's lunches consist of. How many seconds to find Sudbury??? lots of love from Santiago CHILE! I started reading your blog after hearing about you on National Public Radio here in California. Your work is amazing, to honest and lovely. Thank you for making a difference in the lives of so many people! You are amazing. I have to admit, I am not looking forward to your summer vacation. I will miss your sweet "voice." aah Im so glad you didn't have to stop the blog...WELL DONE on raising so much awareness for the charity you picked! thats amazing really well done..so much better than anything I've done and I'm twice your age (at least lol) I'm having a give-away on my blog for national pink day so please do enter (if you like), everyone's welcome! It's been said before but can never be said enough. I came to your blog after it was mentioned on 'Cup of Jo' and have been an avid reader ever since. I just moved from Toronto, Ontario to Seoul, South Korea, and did a rating of my first Korean meal a la Veg (http://jaimeaway.tumblr.com/post/25388513794/alaneverseconds). Keep doing what you're doing! Dear Martha, you really should set up a method of subscribing to your blog, and add it onto your sidebar, to allow us to get an update in our inboxes every time you post! This means we can keep a very close eye on all the wonderful things you write about and do. Yours in blogging, the Fairy Blog Mother! You can subscribe. Go to the bottom of the page and click on "Post Comments Atom". You can set up an RSS feed there. Ah, Cantankerous, but I want to subscribe to Martha's posts rather than the comments. The method you suggest won't send the latest post to my inbox immediately after it is published. An RSS feed can easily be created via Google Feedburner (after all, this is a Blogger blog) if there is no available widget for a subscription service. And the link 'Subscribe by email' below this comment box is also only for comments too. Wow - well done. Heard your dad on radio 2 today. Glad you're now allowed to take pics, and congratulations for your achievement. Martha, you are so amazing, and I can't believe that this has happened so recently! When I first read about this happening, I thought it was at least a month or two ago! I am only 4 years older than you. The school lunches that I get are quite disgusting so I usually pack my own! I live in Wisconsin. Can you find that on your map? I am so proud of you for overcoming this figurative hurdle in your road! I hope you continue your blogs soon, as they are very interesting to me! I was really getting worried that the silly people at the Council had a change of heart and stopped you from doing your blog. I sent an email to your dad and he said you had athletics today and that was why we were still waiting for you to post today's message. I hope you had a good time at your athletics and your school dinner today helped contribute to the energy you needed. Well done for raising so much money by encouraging your worldwide friends to donate money to Marys Meals. Just wanted to let you know that you were in the Sunday newspaper yesterday, in my town of Spokane Washington USA. Good to see you back! I'll enjoy seing all the meals you show us from now on! Way to go! I see amazing things in your future. Welcome back and well done in raising sooo much, keep up the good job. Your lunch blog is a breath of fresh air! It's informative and humourous. Greetings from Canada! So impressed with your blog, Veg - we look forward to reading every day! Goes to remind local politicians that this is a massive global community, and social media is more than just a minor fad, able to be ignored or controlled, whether it is a young person's commentary on school lunches, or an alternate significant media source. I've been waiting for one of you Aussies to come up with the obvious of calling her the Veg-eMighty! I once had an Aussie friend who tried to convince me that vegemite was edible. He failed miserably. I also failed miserably when I tried to convince him that Yank peanut butter was wonderful. Such is the beauty of what Veg is doing by innocently exploring all the different food options sent to her by her readers from all around the world. I admire everything about your country except vegemite. When you are next in Australia you need to make sure you have Vegemite the "proper" way - I think Aussies tend to get a bit overexcited & overdo the vegemite when testing on unsuspecting non-aussies. Moderation is the key - on fresh white bread, or fresh toast, or making butter & vegemite worms on vita wheat biscuits.... yum! Martha, you're an inspiration. The work you're doing is amazing, and it's just wonderful that you're helping out at such a young age. Your blog brings a smile to my face! Kudos on all of your accomplishments, Martha! You do your parents proud. I look forward to seeing more; you are such an inspirational young lady! Keep it up! Children right across Canada LOVE your blog. Keep posting those photos! Canadian school children who are part of Farm to School earn to grow prepare and eat fresh foods from local farms. Kids really enjoy visiting nearby farms, gardens, and bakeries. They line up for seconds and even thirds at their school soup and salad bars. We hope you enjoy this loop of Farm to School photos. I see you're up and running again! Brava my dear! Hard work pays off. I'm happy you're back. :) Keep on trucking Veg! (A phrase we use here in Kansas in the US). Love the blog, great job raising all that money! Such a good cause I'm so proud of you. Hi Martha: I am curious why you sign VEG. Are you a vegan / vegetarian; or aiming to become one? Either way, it is a very healthy attitude and way of life. Cheers! VEG explains her name in the "About Me" paragraph on the upper right side of this page. Hello from Alabama, USA! I have read your blog almost since the beginning, and have really enjoyed it. I was most distressed to read your "Goodbye" entry, and I'm so glad that you are back! It's wonderful that you can learn life lessons, make friends, AND feed children in Africa! I, too, will miss your blog while you are on summer vacation, but I'm sure you are looking forward to the break! Keep up the good work! PS - I love Ranch salad dressing! And you can get lower fat versions. Your and Alexandra's lunches look really good today!! And what a wonderful video thank you! Now that looks more like a dinner should look. Welcome back to our virtual Martha World. Because of 8 hours time difference, I couldn't witness the moment of your return. This early morning at five o'clock, I turned on my smartphone to check your blog. There it is. There had been already 60 comments. You may not know, but I sent a mail of protest to the Argyll and Bute Council. I don't know if it worked, but I feel proud that I could contribute what I can to get you back to the virtual Martha Community on the net, consisting of the people all over the world. I hope someday you will visit Japan and enjoy delicious Japanese foods. Good to have you back Veg, to me your feed today looked way more yummy than Alexandra's, but her plate was prettier. I like colours. Interesting to see that your lunch for today was one of the best yet. I 'ad to larf when I saw the new addition to the ratings system - 'Ease of eating with wrist in stookie.' Very funny - and right now, very important, LOL. I do hope that wrist is better soon. I heard about your food blog on the radio here in California, USA over the weekend. Many congratulations on your successful fundraising and on maintaining your blog. I am happy to see that you are still writing. We've been following your blog for a while! I grew up in England, and my school dinners, honestly, were much more nutritious back then, than some I've seen you feature. Your blog is succinct, and fabulous, and so important. I hope this helps local agencies realize that the brains of tomorrow need REAL fuel to thrive! Congratulations on blasting through your goal, and far beyond, for Mary's Meals. Hang on to your dreams, and you'll go far! Seeing the little children thank you made me feel very proud of you. I am a teacher in Vancouver, Canada and many of my students come from Africa. We serve a "pay if you can" lunch at my school. It is often the only real meal that some of my students get during their day. For such a young girl, you really impress me with your blog and your interest in helping out other, less-fortunate children in the world! Good job sweetheart! I think you are an amazing young woman, and I am inspired by your passion!! You make a huge difference around the world, you are making ripples in a big pond, and you will never begin to imagine how much just your passion makes the difference. Keep you the great work!!! Oh you are indeed a golden child. Good work on the fund raising. I heard this blog at Helsingin Sanomat, that's popular news paper here, in Finland. This blog is great! God bless! Great to have you back honey... keep up the fantastic blog, my kids are loving it. Veg, I am old and retired, and a bit cynical. Your enthusiasm and devotion, and your excellent use of English, have given me many laughs, and hope for the future. Don't let any jealous idiot upset you or stop you, and remember to keep schoolwork first! Veg, love and congratulations to you, and congratulations to your parents. God bless you. Well done for Martha's kitchen. As to the Ranch thing, I am pretty sure it is some kind of sauce for the burger/patty. How much do you or your parents have to pay for that? I hope that one day, your local authority will realise: Pupils also have rights. Because it is a scandal what I can see here. Really pleased to see you are back. I really enjoy reading the updates and will be showing tis to my daughters - the eldest two are 7 and 5. They usually take a pack lunch but they like to have school dinners on a Wednesday sometimes as they do roast dinner which is their favourite. We get given a menu for the term so we know what they are going to be offered. I'll have to see if I can find a copy and get them to give their food-o-meter scoresx for the ones they have. Keep up the good work and perhaps soon there will be a chain of NeverSeconds kitchens throughout Malawi and other needy countries! My one big concern is what are you going to do during the school summer holidays? Martha I haven't read the other comments so someone may have already told you this - Ranch is a salad dressing. Here's a recipe so you can try it at home. Where I grew up, in Oklahoma (how long will it take you to find that one? ), some people dip their pizza slices into ranch dressing. I like it on battered and fried mushrooms, not so much on pizza. That clip of the children brought tears to my eyes. What a time you've had over the past few days - what you thought would stop you raising any more money for Mary's Meals has instead resulted in an amount being raised that must have been beyond your wildest dreams! Well done Martha, I love your blog. I posted a link on my Facebook page so that my extended family could see what you're up to, thank you! The Ranch packet is a dressing for the salad. I adore your Blog!!!!! Glad you didn't have to give up the blog, and i think it's so wonderful that you also use it to help promote Mary's Meals to help give less fortunate kids the opportunity to eat a decent meal! The world needs more kids like you! I am from Belgium. Even here, in Europe, we read our Blog ! It is very funny, well written, that's a good job ! yes, really well done! and i am proud that young people like you can do such inspired and charitable things instead of thinking about the next video game they wanna play. i, being 26years old, am inspired and impressed by you and your work here! keep on going! Well done Martha! I write about your blog on mine!!! I have 2 children, who have similar experiences with lunch at school. Unfortunatly they had capitulated and prefer to have their lunch later at home. I hope, you have soon followers also in Germany, who mobilize the public for the improvement of school meals. I am not sure what happened to the note I sent yesterday. When I read it here on your blog I noticed a few letters had bounced around. Here it is again with corrections. Children right across Canada LOVE your blog. Keep posting those photos! Canadian school children who are part of Farm to School learn to grow prepare and eat fresh foods from local farms. Kids really enjoy visiting nearby farms, gardens, and bakeries. They line up for seconds and even thirds at their school soup and salad bars. We hope you enjoy this loop of Farm to School photos. Brava Martha! Un saluto dall'Italia! so happy you are back - i definitely sent my thoughts to the council but had a hard time posting on your blog...hoping this one goes through!!!! re the gravy and mash...well, just eat the meatballs and then mash the mash into the gravy and your fork will do the trick!!! yum! You're an amazing young woman Martha! People twice and three times your age haven't accomplished what you have in such a short time. You and your family must be very proud. I love your blog! Keep it up! You're accomplishing wonderful things and making such positive changes for so many. Cheers from Boston MA USA! I believe the post said something about the school being affiliated with the UN. I'm guessing it has to do with equal representation from all UN countries? You are such a lovely Earth Angel Veg. Thank you for being You! I'd be more worried about what's in the brown sauce than what's in the meatballs, tho. Congratulations for your blog and for helping less fortunate children. I hope this blog, which is very admirable makes children go home and turn the spot light on their own parents as to what they are fed at home! Its quite obvious that school meals today were not as good as when I went to school but I wonder whether parents are doing their bit to keep children healthy when school only provides one meal a day. From what I see parents buying at the supermarket, children seem to be getting a lot of processed frozen foods, fish fingers, chips, juice, crisps, sugary cereals and not much that looks home cooked either! Well done Martha!!!! You should feel very proud. Today I had a very boring lunch - cheese sandwiches, apple and a cup of tea! So glad you're back with pics!! Well done Martha and keep up the good work. howabout 'forever seconds' for the kitchen name? There's a new site out in cyberspace, probably just because of YOU. Hello from Virginia, USA! This is my first time even looking at this blog, and I must say I'm glad I didn't delete the automatic email that had the link to this blog and the article about this blog. Your story is amazing, and your only nine! It's something I really wish I could have shared with my class when school was in session, because I could have gotten my class and the entirety of our school's Specialty Center to donate something. I'll still try, of course, but since I don't have everyone's info to get in contact with them. Love this blog, and know that you have literally a million people supporting you! The food looks pretty good today. Great to have the blog back in action! I love the "pieces of hair" statistic. I have a suspicion that food hygiene in your cafeteria has been meticulous since your blog started. Martha, I admire you so much! The video of the children thanking you got me a bit teary-eyed. You are quite an extraordinary young lady. Keep being you. Do you ever get to take your lunch to school? This website of homemade lunches made me think of you! So glad you are about to continue having fun with your blog and raising money for your charity. Keep it up girl! Glad to see that you are back, really back. That plate of meat-balls, mash and veg actually looks rather appetising. I am guessing carrot and swede for the veg? Not personally keen on the idea of the "Golden Crunchie" thing, but I do not have a sweet tooth. More importantly, in fact most importantly, the vid of the kids who will now get a meal (and perhaps their only meal that day) thanks to you says it all. I'll send Mary £10.70 for you - food for one child for a year. I am just amazed at how well you've done. You have inspired others and that is a very special talent. However, I would really like to know how long your lunch break is! Unfortunatelly, I don't have any pictures to send you as I don't go to school anymore for a long time, but I remember well that our lunch breaks used to be only 15 minutes!!! It was better in high school though. But 15 minutes meant you had to stand in line, get your food, gulp it down and run to the next class. NOT enough. The system was stamps, every month you get a new collection of stamps with date numbers. Usually our parents had to pay for lunches, but some got it for free if they applied for it and were thought a bit poorer than the rest. Welcome to Wikipedia Martha! http://en.wikipedia.org/wiki/NeverSeconds Since the Argyll and Bute Council has been given a quick and palpable lesson on the "Streisand effect", maybe they could incorporate the phenomenon into a journalism class. You're amazing, Martha! I just discovered your blog and will eagerly await your posts. Great job with all your endeavors, from Seatac, WA state, USA. When are you on summer vacation? Way to go, Veg! Look at what you've achieved! Shame on the local Council - if either they or your school are worried their school meals are going to be shown in a poor light, they need to 'Man up'! Time we started prioritising children's nutrition above budgets! Does that fill you up, Martha or are you still hungry after dinner? Just logged onto your amazing blog, exciting, factual and funny. I LOVE the name for the kitchen. It's great that you don't want to take all the honour for yourself, but you're showing your gratitude to the people who've made donations. You're amazing! I agree with one of the comments too that Veg could stand for Very Enterprising Girl, but you probably wouldn't want to call yourself that! Oh my, we used to get ice cream scoops of mashed potato and meatballs too! (Primary school, near Kirkintilloch, late 70s/early 80s.) It was always my favourite so your photo has brought back good memories. 21 seconds is not bad for such a small country :-) I live in Belgium btw. Did you know that 'Belg' is actually what you would call us ( inhabitants of Belgium ) ( at least in dutch , I think it's Belge in french ). Great pictures of the lunches from different countries. Back in May, you mentioned Gummies in someone's lunch - I think they are gelatine/jelly fruity things made from fruit juice or extracts thereof. Kinda like makes one think you are getting a "healthy option". And in June someone had a tray from the States with a packet called Ranch which is short for "Ranch Dressing", a popular salad dressing in the US. It's "made of some combination of buttermilk, salt, garlic, onion, herbs (commonly chives, parsley, and dill), and spices (commonly black pepper, paprika, and ground mustard seed), mixed into a sauce. Sour cream is also frequently used..." Very yummy. Did you have to sneak your camera into school to take pictures of the food?